The most enjoyable way to explore Stockholm is on foot. The oldest part of the city, Gamla Stan, is extremely compact, and lots of Stockholm’s main sights are within a half-hour walk of that neighbourhood. If you start to get tired or want to strike out beyond the city centre, you can always let the public transport system take the strain. Stockholm’s boats, trams, buses and subway trains are almost all operated by one company – Storstockholms Lokaltrafik (SL) – which means you can easily hop from one mode of transport to another. 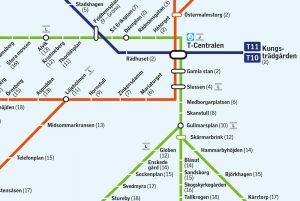 Scroll down for details on paying for journeys in Stockholm. Stockholm’s tunnelbana, or T-bana, consists of three colour-coded lines (see map below). Stations are marked at ground level with a large ‘T’ and are dotted around the city centre. Trains run from roughly 5am–1am each day, and provide one of the best options for getting around Stockholm. One thing you’ll notice when riding the tunnelbana is the art covering the stations’ walls and ceilings. Free, guided art walks that describe some of the works in more detail are run in English from June–August each year (just turn up at the SL shop on Sergels Torg at 3pm on a Tuesday, Thursday or Saturday). For many journeys, especially if you’re heading out into the suburbs, buses are the best option. There are dozens of lines crisscrossing the city and the buses are generally clean and reliable, even when it’s snowing. Press the yellow or red ‘stop’ button when you want to get off and the driver will pull over at the next stop. Note that the buses we mention in the arrival section (for airports and ferry terminals) are privately run – you need a separate ticket to travel on them. Trams only really serve Djurgården. There’s no subway service on the island so the trams provide a scenic alternative, linking central Sergels Torg with Waldemarsudde at the southern tip of Djurgården, passing a few excellent museums en route. Ferries are one of the joys of travelling around Stockholm. Boats run from the city centre to the Stockholm archipelago, but there are also a couple of really useful city-centre lines that make it easy to hop between central islands. The year-round Djurgården ferry shuttles between Slussen (at the southern tip of Gamla Stan) and the island of Djurgården. Often, the same service also stops at a jetty on the eastern side of Skeppsholmen. Additionally, the Sjövägen 80 boat line connects central Nybroplan with Frihamnen in an almost-circular loop, stopping at Allmänna Gränd on Djurgården along the way. 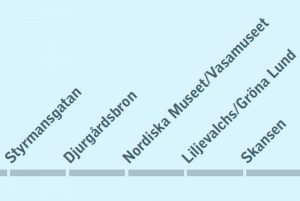 This route is handy if you want a quick way to get from the downtown area to the museums on Djurgården. To plan journeys by public transport in Stockholm visit SL.se – the service is available in English but the website can be clunky. There is also an app for iPhone and Android that allows you to buy tickets quickly and easily – just bear in mind that these tickets are more expensive than using an SL Access card. All of the attractions we’ve listed in our Stockholm guide include details of the nearest subway station, bus stop, ferry dock or tram station. If you want to travel by public transport in Stockholm, get yourself the SL app (for iPhone or Android) or the SL Access card. The app lets you buy single-use tickets using a credit card, and the time starts running out as soon as you complete the purchase – although convenient, this quickly gets expensive. 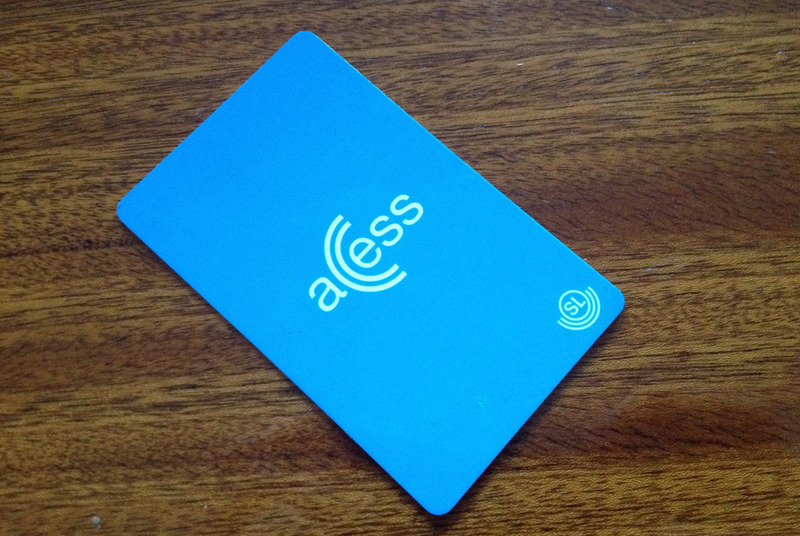 The card can be loaded with cash or tickets and used to pay for journeys in and around Stockholm. The card costs 20 SEK and is available at Pressbyrån and 7-Eleven stores across the city. You can also buy the card at the SL Center on the ground floor of the Central Station. The best option for most visitors is to load the SL Access card with a timed travelcard – these give unlimited travel within the area for a set period of time. You can pay for 24 hours, 72 hours, or a whole week. 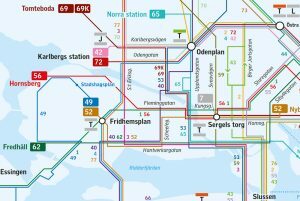 Subway trains, buses, trams and the Djurgården ferry are all included. If you’re only going to make a couple of journeys, load your card with 100 SEK (that’s the minimum amount) and use it on a pay-as-you-go basis – one-way journeys in the city centre cost 32 SEK. The vast majority of stations on the tunnelbana have automated barriers. Just hold your ticket against the blue panel to enter – there’s no need to ‘check out’ when your journey is over (the barriers open automatically when you approach them). On buses, boats and trams, simply stamp in as you climb aboard. 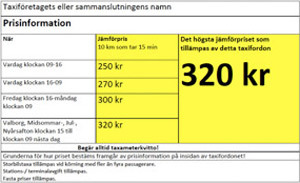 Don’t forget to do this – if your ticket is checked and you haven’t stamped in, you’ll face a 1,500 SEK fine. Taxis are generally safe but a few dodgy drivers have given the industry a reputation for ripping off tourists, either by charging extortionate prices or driving around in circles to bump up the fare. All taxis should display yellow stickers in their windows – the large number on the right represents the highest amount they can charge you for a 10km journey that takes 15 minutes. It’s a crude way of allowing passengers to quickly compare prices before getting in. Our advice: only use taxis that display these yellow stickers, and ask for an estimate of the total price before you set off. The market is unregulated so don’t be afraid to ask around until you get a price you’re happy with. Stockholm is a great city for cyclists and dedicated bike lanes thread their way through the city centre. The city’s bike hire scheme – City Bikes – runs from April to October each year. To rent a bike you need to buy a three-day pass (available from many hotels and branches of 7-Eleven), or a buy a season ticket. With either of these you can hire bikes from stands dotted around town for up to three hours at a time without incurring an extra charge. If you’re happy walking, you might want to check out our nifty walking map – it shows the approximate amount of time it will take you to walk between each subway stop. You’ll be surprised by how quick it can be! We wouldn’t recommend driving when you take inner-city journeys, but if you fancy taking a few day trips or want to explore further afield, having your own wheels can be very handy. Just make sure you rent a place with parking, as those charges can quickly spiral out of control! To book a rental car before your trip starts and to pick it up when you arrive in Sweden, use the form below. It’ll search hundreds of local providers for you to find you the best deal.